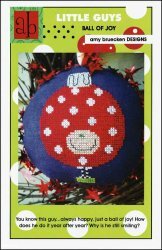 Little Guys: Ball Of Joy [H5813] - $6.00 : Yarn Tree, Your wholesale source for cross stitch supplies. You know this guy . . . always happy, just a ball of joy! How does he do it year after year? Why is he still smiling? Stitch count 40 x 66.